[Via Satellite 12-16-13] Space Systems/Loral (SSL) and AsiaSat signed a construction agreement for AsiaSat 9, the replacement satellite for AsiaSat 4. The new satellite will be used for television broadcast, private networks and broadband services across the Asia Pacific. Designed to operate in C-, Ku-, and Ka-band, AsiaSat 9 will be located at 122 degrees east longitude. It will provide service to multiple markets with more active transponders and higher power performance than the current AsiaSat 4 satellite. The AsiaSat 9 spacecraft is based on the SSL 1300 platform, and is designed with the flexibility to include a weather sensor at a future date. 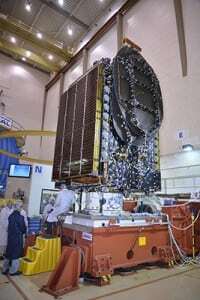 AsiaSat’s two new satellites AsiaSat 6 and AsiaSat 8, scheduled for launch in the first half of 2014, are also built by SSL. AsiaSat 9’s launch is currently planned for 2016.